What to do after rooting your phone? 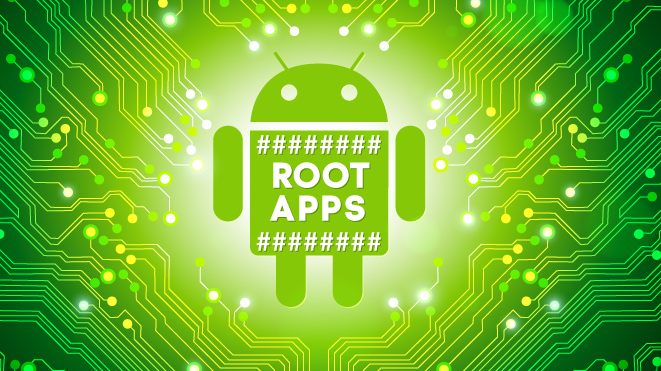 After, rooting your device, you can simply use these special root apps, which we are sharing today on this blog.After rooting your android device, you can use many useful apps on your phone. I will mention here some very popular apps and their uses which require root.So, without wasting time, lets move to the collection of some must-have root apps. AdBlock Plus is a free, open source application that removes advertisements on your Android device. It’s considered a must-have for root users even if those of us who make a living on advertising hate that. This one is configurable so that some unobtrusive ads get through which is nice and the app is configurable. Flashify is a root app that all root users should have. What it does is allow you to queue up stuff to flash from recovery without having to reboot your phone. This includes zips, mods, kernels, boot images, recovery images, and much more. This is a great tool for root beginners or amateurs and it’s especially great for those who don’t enjoy using ADB and Fastboot commands. It’s simple, it has a good, modern interface, and it just works. Greenify quickly climbed the list as one of those essential root apps a long time ago. The app checks out your running apps and shows you which ones are running, which ones have been run, how frequently they have run, and how many times each one wakes up your device. Using this information, you can hibernate apps to prevent them from running in the background and drain your battery. Link2SD is a root app that allows you to move apps over to your SD card. It creates links to make your device believe it’s actually on your device so it works for apps that conventional Apps2SD apps don’t work on. This is a great way to take advantage of your external SD card space. It’s not as great as Marshmallow’s adoptable storage, but it’s a good alternative until people actually get it. Quick Boot is an app that is both absurdly simple and absurdly useful. In most versions of Android, the power menu is weak sauce and you can only power down and sometimes you can reboot. Quick Reboot fixes this by allowing you to boot to recovery, and boot to bootloader. If you go pro, you’ll also get Tasker support as well as a hot boot option which just reboots the Android UI. It’s quick, simple, and makes finding an advanced power menu for your device a little bit less of a priority. SuperSU by Chainfire is the de facto Superuser application available. 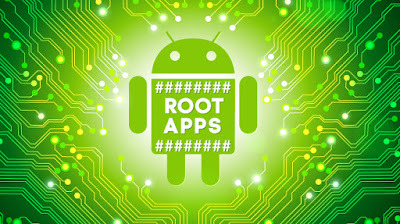 Most root methods have you installing this app anyway so most new root users already have it. It’s a solid root app with a ton of features and it acts like the front door to your device so any old root app can’t just go nuts. You’ll have a list of all the apps that have requested and been granted (or denied) root access. You can also fully unroot your device, keep logs, and more. It’s also frequently updated which is what you want in a Superuser app. Titanium Backup is a long time mainstay at the top of many root lists and it feels almost blasphemous to not include it here. With this application you can uninstall bloatware (a must have for many people), freeze apps (leaves them installed but prevents them from ever running), and backup your applications and application data. ROM flashers have sworn by this app for years and it may very well be the most popular and oft recommended root app of all time. If you have root, go get it immediately. Root life just isn’t the same without it. Viper4Android is an audio modification tool that gives you untold amounts of control over how your audio sounds coming out of the speakers, out of Bluetooth devices, and out of your headphones. It comes with its own audio driver, an equalizer, tons of effects that allow you to control how your audio sounds, and a lot more. It’s a complicated install process and you’ll need to go to the official XDA thread for downloads and instructions, but this is as good as it gets when it comes to audio modifications on Android. Xposed Installer is one of best rooted app 2016.This is another app which is equal to rooting your phone. This app installs the internal binary to your phone which can change you notification bar looks, your settings, apply themes to your rom and change almost anything on your phone. You can download from xda.Though, this is best root app, but still this app is available for free from the Google Play Store.No wonder this app is one of best root apps for rooted android mobiles 2016. Dumpster is a data recovery tool that can find files you have deleted and then restore them. It supports photos and videos like most, but also music files, documents, PDFs, and pretty much anything you may have accidentally deleted. Like most recovery tools, root isn’t required for use but having root access can improve the app’s performance and help it find more lost files. Once installed, it acts like the Recycle Bin on your computer and you can delete files permanently if needed. It’s a good app to have around, just in case. System App Remover allows users to uninstall bloatware and other undesired system applications from their devices. Additional apps by manufacturers called bloatware degrades device performance and can’t be removed easily without such an application. It also allows users to uninstall user-installed apps, move apps to SD card, etc. XBooster is a system booster. It controls the system’s parameters through profiles. You can switch between profiles to set the required performance output from your Android device, and the app changes the system’s parameters as required by the set profile. It offers two modes (hard gaming and multi-tasking), features such as scheduled boost, system apps killer and more. Boot Animations is an application to view and modify the boot animation of your Android device. You can download boot animations from the web and set those for your device using this app. The app also offers a nice collection of free boot animations that supports every screen size and resolution. Amplify Battery Extender uses advanced technology to extend the battery life by limiting resources to background apps. It detect apps acquiring the CPU and GPU resources in the background, and restricts them to save the battery juices. The app can also be used to monitor activities, and requires Xposed framework to function. BusyBox is a set of tools and libraries, used to support running various Linux commands on your Android device. This app is requisite to use many other root applications. The installation unlocks many advanced root features such as better control and management of the device. AZ Screen Recorder can be used to record the screen of your Android device and save the recording in mp4 format. The application comes very handy for bloggers and tutors to record steps for a tutorial. It also supports advanced settings such as resolution and speed customization, etc. StickMount allows your device to support any On-The-Go flash drive. You can use this app to mount and use pen drives on your device if the default internal storage isn’t sufficient for your storage requirements. It can also create and edit labels for the inserted flash drive. This app is one of best root app for MTK Android devices 2016.If you’re having any GPS related problem or want increase the volume of you speaker it helps you do that also. This app can change almost every functionality of Rooted MTK Android devices without any kind of problem. Are, you a gamer? Oh, than you cant miss this app. Chainfire is one of best root app 2016 which can be used to increase performance of your games by reducing rendering graphics.This app is must have root app for gamers, as it helps in lowering the graphics of your games, which prevents game from lagging and makes the gaming experience super awesome. Call/whatsapp : 9035701781 / 8197237597. 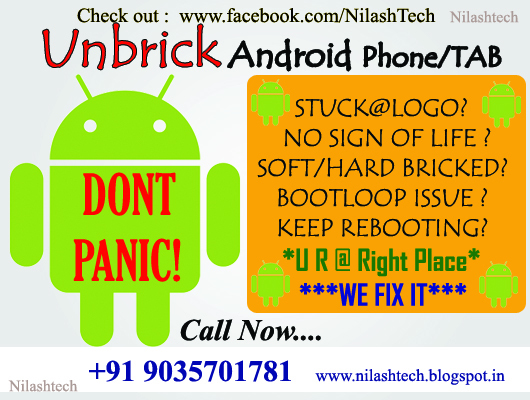 If your Android phone or tablet not booting or stuck at start up LOGO ., ??????? you are at right place., don't be upset I'm here to help you out (If its software issue). Important : Dont worry if some other person told that your phone hard bricked or motherboard gone or what so ever...still that can be recovered. be cool..DON'T GIVE YOUR PHONE FOR HARDWARE REPAIR SHOP IF ITS SOFTWARE ISSUE AS IT MAY REDUCE THE CHANCES OF RECOVERY OR IT MAY PERMANENTLY DAMAGE YOUR PHONE. 1. 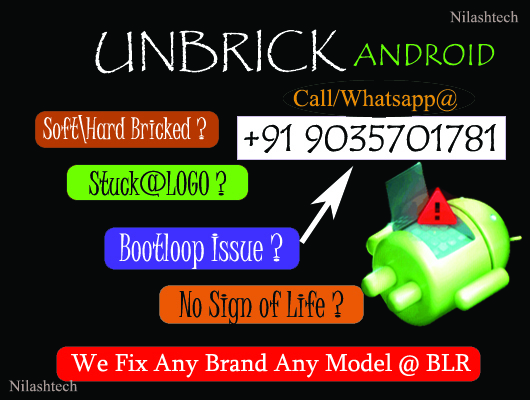 UNBRICK/RECOVER DEAD/BRICKED/NOT BOOTING/STUCK AT LOGO ANDROID MOBILES. 2. NO DISPLAY ONLY CHARGING LIGHT BLINKS - FIXING AND RECOVERY. 3. 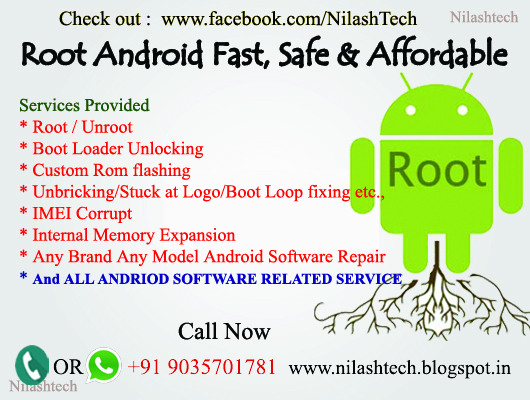 ROOT/UNROOT AND Data Recovery After Factory Reset. 4. NO RECOVERY, NO FAST-BOOT/BOOT-LOADER, NO OS FIXING AND RECOVERING. 5. ADB NOT RECOGNIZING FIXING . 6. FIRMWARE UPGRADE AND DOWNGRADE. 8. APPS FORCE CLOSING FIXING. 10. HANGING ISSUE_ANDROID PHONE OPTIMIZATION AND BATTERY TWEAKING. 11. APP2SD INSTALLATION WITH MEMORY CARD PARTITION. 12. 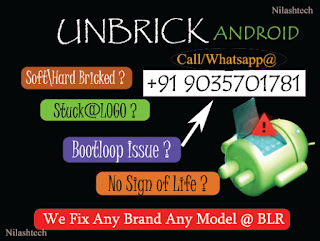 AND MANY MORE....One Place for all Android related Solution. Fast, Safe and Affordable. Any enquirers contact without hesitation. Call or whatsapp @ +91 8197237597 / 9035701781. Location : Hulimavu,Near Meenakshi Mall, Bannerghatta Road..
Rooting Android: What Is it? If you've heard about "rooting" your Android phone, and are confused by what exactly it does, or don't understand the instructions you found on an obscure forum or blog post somewhere, this guide might help you make sense of things. 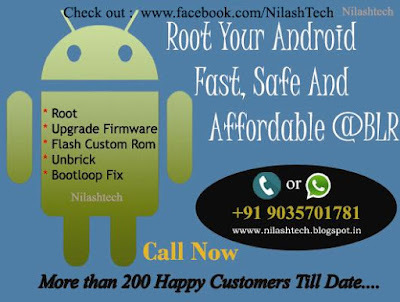 In simple terms, Rooting is a process of unlocking your Android phone which lets you conquer the limitations that the carrier or the manufacturer of your phone has imposed upon it. These limitations are placed to prevent you from making changes to the system – which can accidentally render it unusable if you don't know what you are doing . Rooting allows you more control over your device and vastly extends the functionality, even giving you the option of using a custom version of Android. Now, there’s a lot of confusion between rooting your Android phone and flashing a custom ROM. Rooting and installing a custom ROM are totally different from each other. To put it simply, rooting is modifying your phone’s operating systems to gain full control over it. On other hand, flashing a custom ROMs is simply installing a modified operating system to your phone. It’s still Android but a modified one courtesy of some tech geeks who managed to tweak the Android SDK. We at NilashTech help those who want to ROOT(/Flash Custom Rom/Unbrick Android etc.,) their Android Phone Or Tablet @ very Affordable price and safely. Remote Service also Available All Over World. Check out this link Our Services for more information. 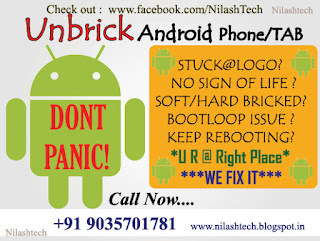 NilashTech. Simple theme. Powered by Blogger.